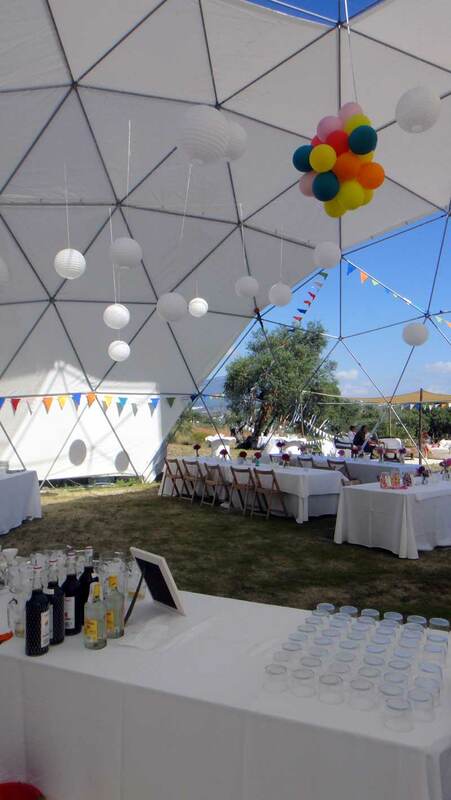 One of our large event domes used recently for a wedding celebration in Spain. 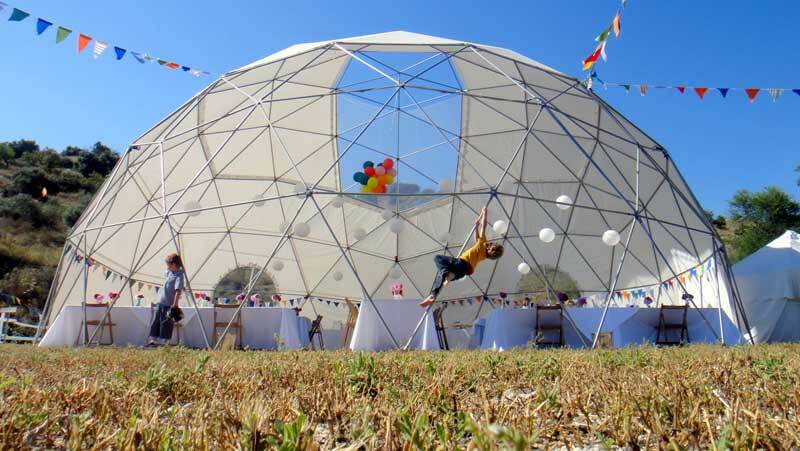 This 15 meter giant can comfortably seat 80 people sheltered from the outside elements. 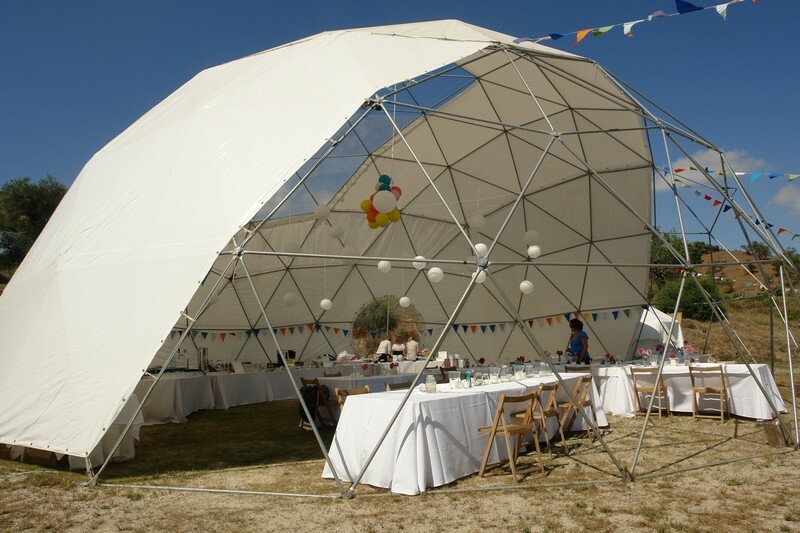 The stunning 3/4 PVC cover allows plenty of light and breeze inside the dome while providing shade from the blazing sun. 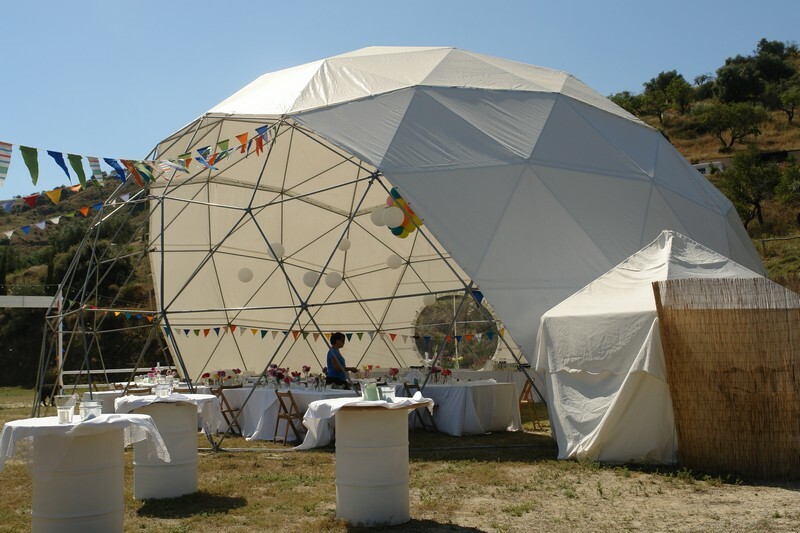 Geodesic domes incredibly versatile. 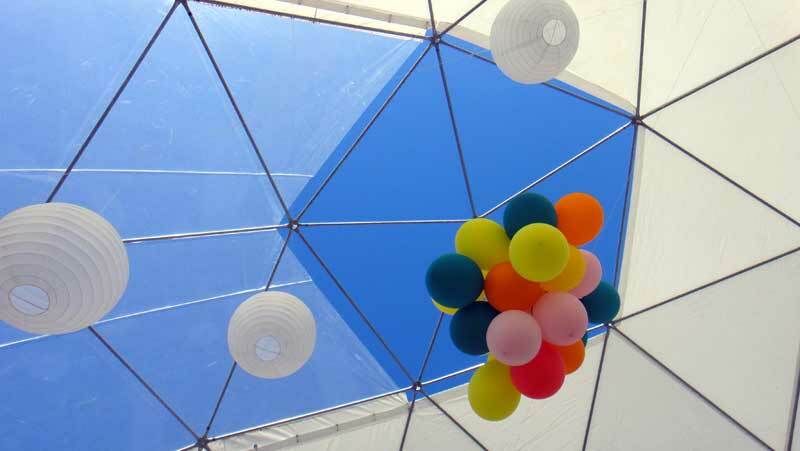 Here's a series of photos from one typical day in the life of a geodesic dome. Looking up from the center of the dome showing the pentagon opening and the transparent roof panel. The view looking out from behind the catering area . 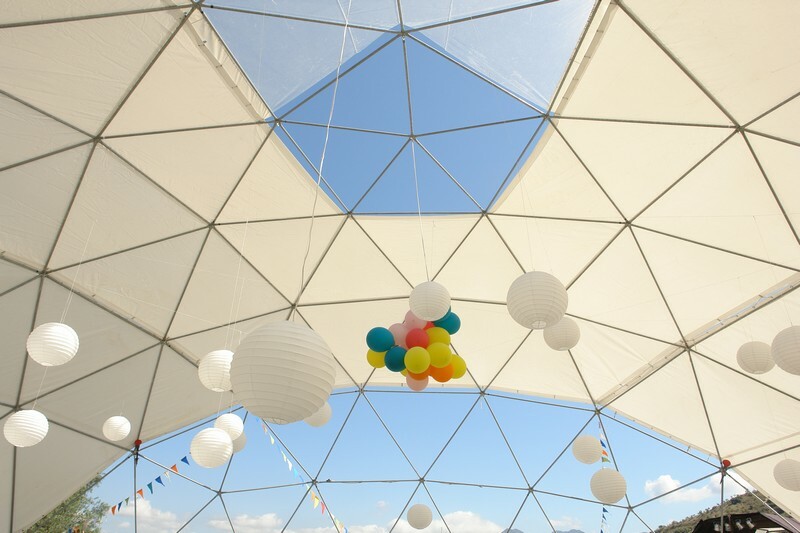 Geodesic domes give an amazing sense of space and light. The stage is set and ready for the wedding party. 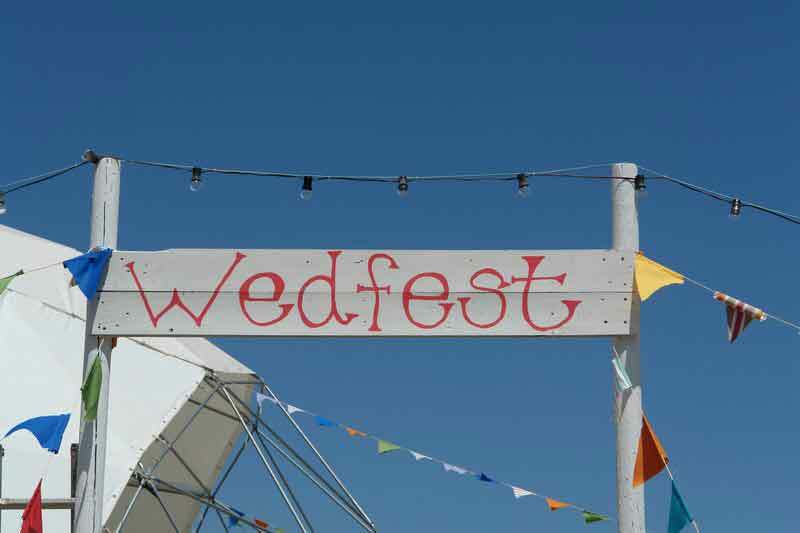 We can supply all aspects including furniture, lighting, sound equipment etc. . 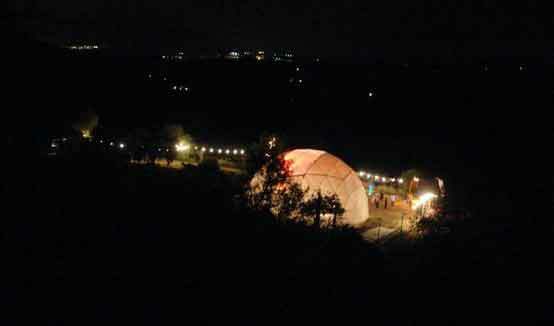 The geodesic dome and stage from a distance . For a sense of scale, look for the 3 people at the rear of the dome! . 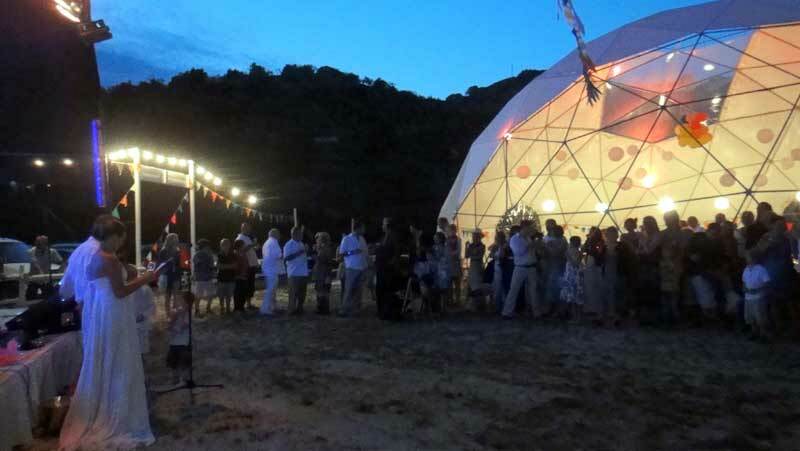 The dome fills up as champagne and canapes are served. 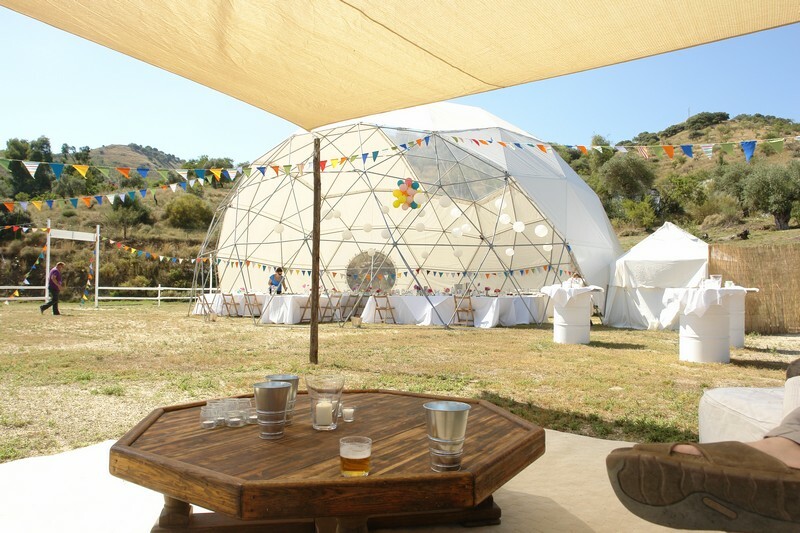 A 15 meter diameter dome can comfortably seat 100 people with ample catering facility space. 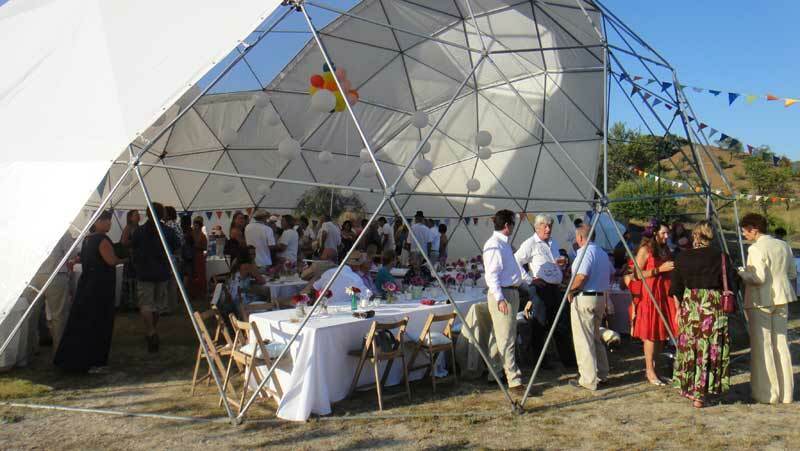 Geodesic domes give a certain sense of luxury and style to any event. The view from behind the bar . 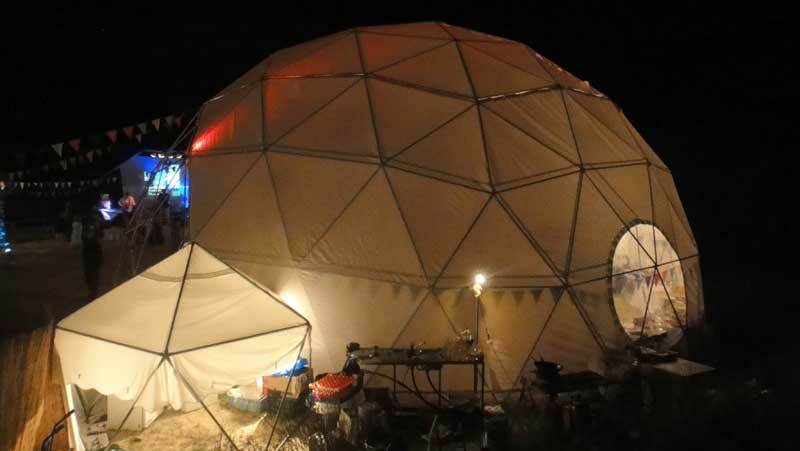 As the sun goes down the dome cover begins to light up and dominate the surroundings. Lighting is a very important part of any event. We can supply lighting from the stylish and conservative to the more nightclub style. 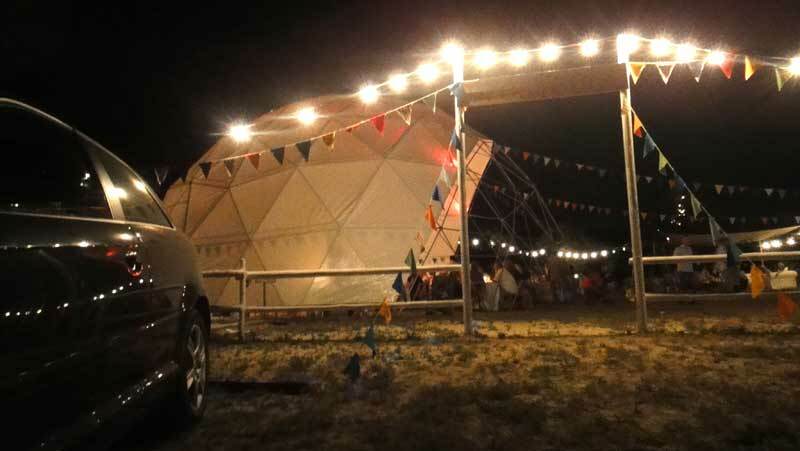 The dome roof at night ..
Our geodesic domes make great motor sport event domes . 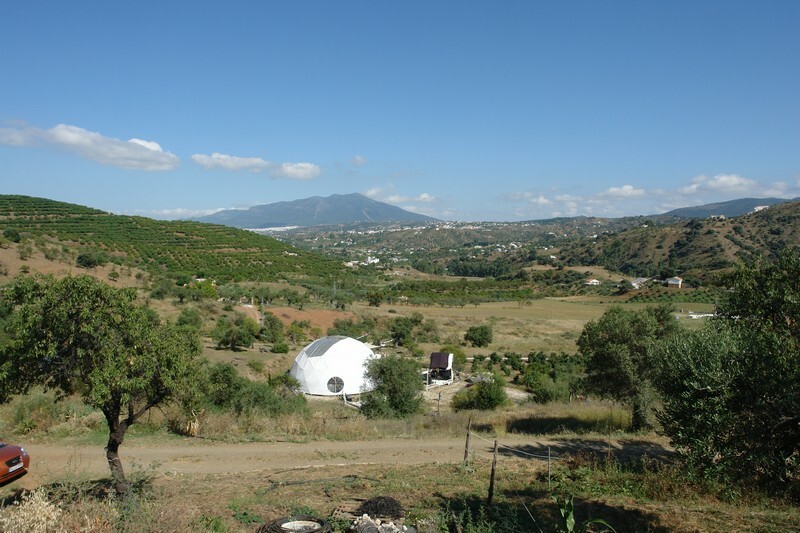 A geodesic dome lit up from the inside can be seen for miles around! 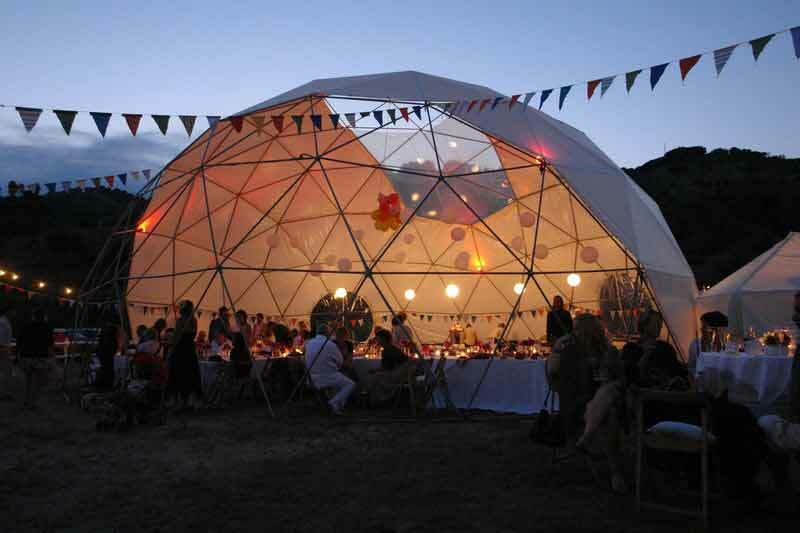 A well lit geodesic dome gives any occasion an amazingly calm and tranquil atmosphere. The perfect place for a banquet, party, concert or promotional event. 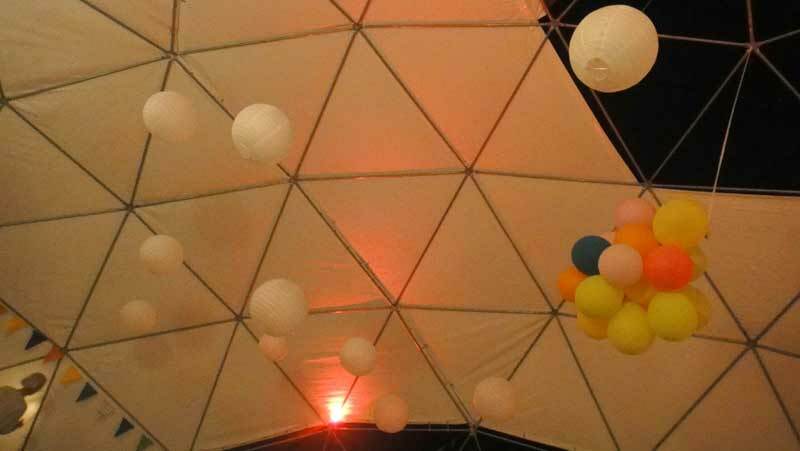 Lit up from inside and out, a geodesic gome never fails to grab the attention. 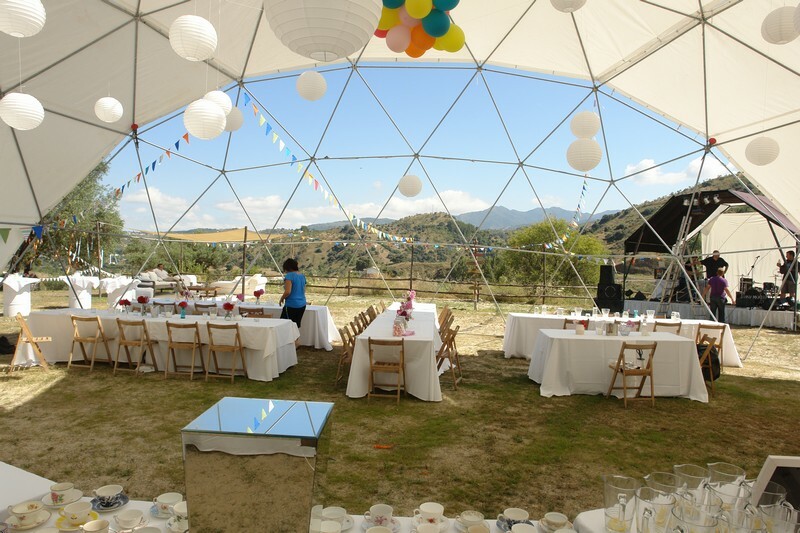 Please check out our other photo galleries of our domes in action.